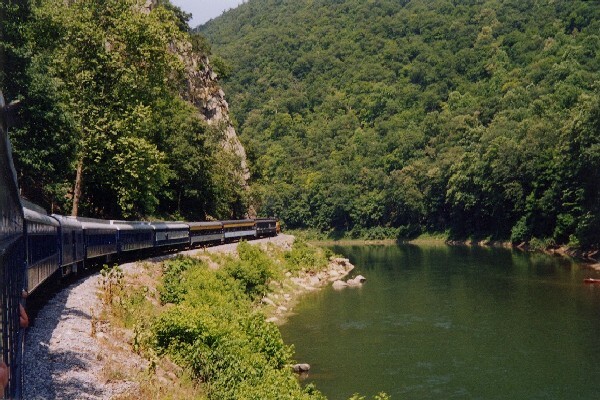 The South Branch Valley Potomac Eagle alongside the south branch of the Potomac River in West Virginia, 2003. Copyright Steve Dunham. Negotiations are under way to preserve MARC service beyond Maryland to Martinsburg, WV. Rail Passengers Maryland are working to alert passengers. Please see that organizations website. Amtrak returned to Roanoke Oct. 31, 2017, with a single daily round trip between Roanoke and the Northeast, leaving Roanoke in the morning and arriving at Roanoke in late evening. Please visit the Amtrak website for schedules and tickets. Amtrak, rail advocates, government officials, and business leaders met in Cincinnati Sep. 23 to discuss improvement of the ChicagoNew York Cardinalincluding daily service. Read more. The town of Bedford, Virginia, between Lynchburg and Roanoke, wants the Roanoke train (which began running Oct. 31, 2017) to stop there. VARP president Mike Testerman is assisting the town with its efforts. More than 8,000 citizens have signed a petition asking for the train to stop there. You can learn more and sign the online petition at www.thebedfordstation.com. Amtraks New YorkChicago Cardinal and New YorkNew Orleans Crescent now have Business Class seats. Welcome to VARPs station on the World Wide Web. The Virginia Association of Railway Patrons is a nonprofit, tax-exempt membership organization working to promote expanded rail service in Virginia and West Virginia. Donations are tax-deductible.